It's Cinco de Mayo! Ole! It's pretty gloomy out for most of us on the east coast, but you're not disheartened. As a matter of fact, you've decided to keep some sun in your heart even when you can't see it in the sky. C'mon, share it and brighten other peoples' day. 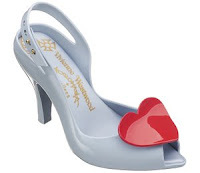 Your Vivienne Westwood x Melissa Lady Dragon slingbacks (available at epauletshop.com) are the perfect way. You've had them since their January debut, and you've finally found the right occasion for their inaugural run. What better day to debut them than a rainy one? They're rubber, so they won't get ruined in the rain, and the red heart makes them festive. The 3.5 inch heel isn't as high as you usually wear, but that just means you can dance more tonight. A pretty Pomegranate Margarita (recipe & image courtesy of Cabo Wabo) tonight would only be right. You can settle for whatever your bartender concocts, or you can ask for Cabo Wabo Reposado Tequila mixed with a little simple syrup, a few pomegranate seeds and some passion fruit juice. It'll be a tasty concoction, but don't overdo it. If you do, you'll wake up feeling like your head was the pinata at the party.